There comes a time in a bloggers life when you’re bursting to share some good news with your readers and today, I had one such moment. 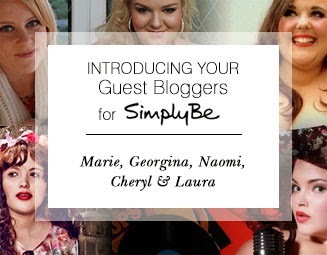 I am so happy to announce that’ll I’ll be writing for Simply Be over on their website along with four other fabulous bloggers; Naomi, Georgina, Cheryl and Marie. I’ve met the lovely Naomi and Georgina on countless occasions but on Monday, I got to meet Cheryl and Marie for the first time and they’re lovely ladies; I just know you’re going to love them. Over the coming months, we’re each going to be writing some posts for Simply Be on topics ranging from fashion to accessories and beyond and I’d love it if you could support us by giving them a read. We’re going to be sharing our fashion know-how and sharing our tips, tricks and advice with you all so if there are any topics in particular that you would like me to write about or any items you’d like to see me style then please let me know and I’ll put them forward to the Simply Be team. My first article is all about summer fashion. I’ve planned out three summer event outfits complete with accessories to keep you covered this summer. Fancy giving it a read? Then head on over to the section where my articles are, here and you can check out my about me and my inspirations here. Simply Be have created a dedicated writers area where you can meet each of the writers and read the articles we publish. It’s worth a look, even if I do say so myself!